In 1773-1774, William Bartram travelled throughout the Southeastern U.S., cataloguing flora and fauna along the way. In his Travels & Other Writings, he writes of the Carolina parakeet, the only native North American parrot species, now extinct. The parakeets (psitacus Caroliniensis) never reach so far North as Pennsylvania, which to me is unaccountable, considering they are a bird of such singularly rapid flight, that they could easily perform the journey in ten or twelve hours from North Carolina, where they are very numberous, and we abound with all the fruits which they delight in. I was assured in Carolina, that these birds, for a month or two in the coldest winter weather, house themselves in hollow Cypress trees, clinging fast to each other like bees in a hive, where they continue in a torpid state until the warmth of the returning spring reanimates them, when they issue forth from their late dark, cold winter cloisters. They are easily tamed, when they become docile and familiar, but never learn to imitate the human language. 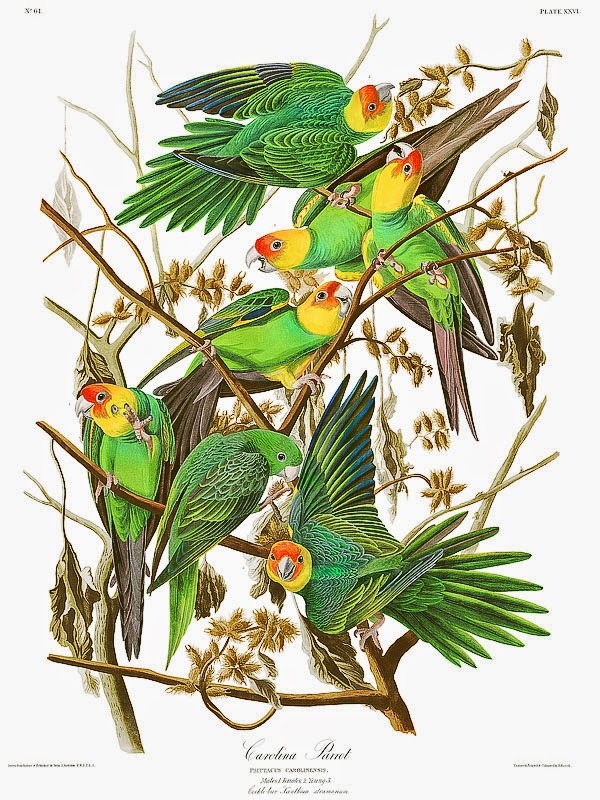 For more information on the Carolina Parakeet, visit: Audubon on the Carolina Parakeet. Resources: Bartram, William. Travels and Other Writings. New York: Penguin Books, 1996.